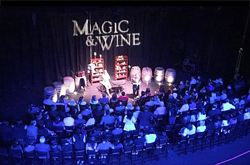 Join David Minkin, International Champion of Magic, for an intimate evening of wine tasting and world-class magical artistry. David starred in two television magic series, as well as the documentary film, Magicians: Life In The Impossible. When Johnny Depp saw him perform he commented, "That's the greatest thing I've ever seen!" The first hour features wine tasting and hors d'oeuvres at the beautiful Majestic Garden Hotel, followed by a 90-minute close-up magic performance by one of the world's premier close-up magicians. Seating is limited to 100 guests to maintain an intimate experience. Please note: No cameras/audio/video or ticket refunds. AGE: This event not recommended for children under 10. Guests under 21 will not be served alcohol.